Part of the ‘Reveal the Shield’ subline, Tracks was released last in 2010. Fitting into the ‘Classics’ / ‘Generations’ collector niche, the figure has a rubsign on the car’s roof allowing you to discover that Tracks is indeed an Autobot. While I appreciate rubsigns, there’s got to be a better way to use them than to just slap one on a G1 character update. Maybe have figures where the allegiance really is unknown; have the rubsign actually reveal something about the character? 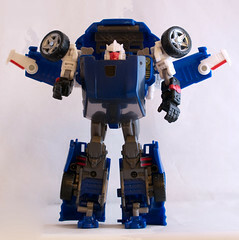 Serving as an update of the G1 character, Tracks satisfies but not completely. His alternate mode remains a blue Corvette-esque sports car with flames on the hood. His robot mode is the weaker of the two modes. It’s just sorta boring and his wings don’t look great. While “Reveal the Shield” Jazz is a definitive Jazz, I feel that Tracks could use another go. But in the mean time, it’s not a bad figure; and it sure beats the movie aesthetic, so I don’t regret the purchase.